Workflows provide the ability to automate processes with SharePoint Online. This book will how you how to get started using the free SharePoint Designer tool from Microsoft to create your first workflow. 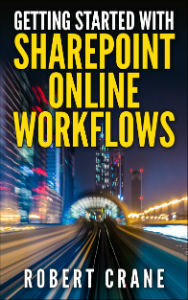 The book is aimed at those who have never created a SharePoint workflow and are looking to get started. It does not provide a deep dive into SharePoint Designer, programming or SharePoint Online. It is merely designed to give you a basic understanding of how to create workflows so you can start building and publishing your own quickly. Once you purchase this title and register your email address you will be entitled to free upgrade editions when they become available. If you also provide feedback in what topics you would like future editions of this book to cover you will receive a free PDF copy of Getting Started With SharePoint 2013. You can register your details and provide feedback at http://www.ciaops.com/contact.